The Sorrow of Belgium is not just one novel. Behind the title hides two works. 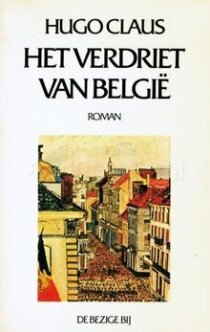 Each one – in the book simply called The Sorrow and of Belgium – is presented as the work of their protagonist, Louis Seynaeve. The real author of the diptych is Hugo Claus, a magician of an artist, who in the pages of The Sorrow of Belgium cannot be pinned down to one style or genre. However, none of this is noticeable at the start. The Sorrow is a novel about a boarding school, neatly arranged into 27 chapters, each with a title, and written in a visual, at times emphatically poetic language. Louis Seynaeve is depicted as a child that has been separated from his mother at far too young an age. Apart from school holidays, he is raised in a boarding school, which serves to reinforce his insecurity and confusion. The boy’s surrogate home is run by nuns: half-hearted, highly manipulative beings who engender a desire for absolute order and purity in the intelligent and sensitive Louis. The young boy develops fantasies about white-robed ladies imprisoned in a Bad House: noblewomen to whom he and a handful of comrades want to be important. Out of sight of the nuns and other boarders they consider inferior, they pretend to be knights, members of a secret society for the honour and glory of God and the Virgin Mary. Their self-proclaimed leader, Louis, needs these games to survive within the walls of the school. Yet he gradually distances himself from this childish, romantic, fantasy world, at least in his mind. With war approaching near the end of The Sorrow, he literally says goodbye to the boarding school and his childhood. However, the absence of all the certainties he had created for himself solidifies into melancholy. The erstwhile boarding school boy still struggles with the impossible desires buried deep inside him. It is in this state of mind that he enters the big world. This is what happens in of Belgium, with Claus’ protagonist describing how his homeland is successively overpowered, occupied and liberated. Surprisingly, the now adolescent Louis still needs a few more years to really free himself of the “silly” fantasies that gave his life inside the boarding school structure. Much of the novel The Sorrow returns with some variations in of Belgium. Louis Seynaeve renounces the Christian faith during the occupation, but he will play a knight again, this time as a member of a fascist youth group. He resigns from the group relatively quickly, but he is still not emotionally ready to give up his childish belief in order and purity. On the one hand, he submerges himself in an easy nihilism, on the other, his need for absolute certainties and order continues to influence his budding authorship. The Sorrow, drawn from his melancholy and seemingly coherent and apolitical, is the best evidence of this. In of Belgium, the genesis is sketched of this purely aesthetic novel. Furthermore, the violence against all that is impure and strange that was only touched on in The Sorrow, suddenly rears its ugly head. Louis Seynaeve only shows signs of fighting back against this ideological foolishness in the deliberately fragmented of Belgium, an artist’s novel, family saga and period fiction that is pointedly grafted on to historical and political reality. Taken as a whole, The Sorrow of Belgium is a powerful warning against the sort of innocence and naivety that is rooted in totalitarianism: reason enough for everyone to read this enjoyable and renowned book from cover to cover.